Can you really have the best of both worlds in your apartment with a prime location and a charming feel? At Camden Phipps you can! Come home to our quaint Buckhead apartments ideally located in what is known to be the shopping capital of the Southeast. The Shops of Buckhead, Phipps Plaza and Lenox Square are all within a mile from our community. And with Publix, Trader Joes, Whole Foods and Lucy’s Market right around the corner, you won’t run short of grocery options. Our one, two and three bedroom apartments and two and three bedroom townhomes feature a full-size washer and dryer, stainless steel or black appliances, granite countertops, decorative crown molding, large walk-in closets, bay window, built-in bookshelves, and a private patio or balcony. The three bedroom townhomes don’t come available very often and you will see why. They feature three full bathrooms, a den, a study, a huge master bedroom (21’ 4” x 15’) and a closet with two built-in cabinets. Take advantage of our amenities. Entertain your friends and family by getting together for a barbecue by the pool. While you are using the large grill prep area that also includes two gas grills, your friends and family can hang out on the barstools and watch you chef it up from the large circular granite bar top! Cool off on a hot Atlanta summer day in our salt water swimming pool. Say goodbye to your gym membership too. Complete your workout at our 24-hour fitness center that includes cardio equipment, free weights and extra space for stretching and yoga. We bet your dog will love to play in our dog park or go for a walk around our beautifully landscaped community. Looking for something to do on the weekends in Buckhead? Hit the links at the North Fulton Golf Club, Bobby Jones Golf Course, or catch a concert at the amphitheater in Chastain Park. Visit, dine, or host an event at the historic Swan House. Now, part of the Atlanta History Center, the Swan House was featured on the 19th season of the Amazing Race. For all of you Hunger Games fans, you should recognize the Swan House in some scenes of The Hunger Games: Catching Fire and The Hunger Games: Mockingjay, Part 2. Grab breakfast or brunch at the Buttermilk Kitchen, lunch at The Hungry Peach or dinner at the acclaimed Bone’s Steakhouse, or sushi at Umi. Okay, we’re hungry now! After dinner, go for a night cap with friends and visit any of the area’s glitziest nightspots. Commuters have easy access around the city with the GA400, I-75 and I-85 interstates. The Lenox Marta Train Station and four of Atlanta’s major hospitals are close by, too. Buckhead is more than just shopping – this bustling urban area is a true live-work-play hub. Live in the best of both worlds. Come home to Camden Phipps. Get the perfect spot! 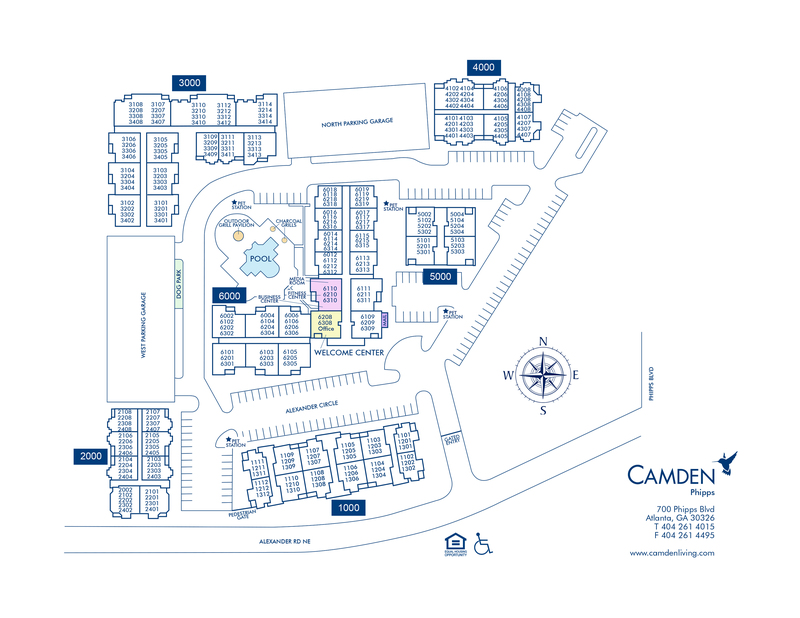 We have ample open parking for our residents and visitors on a first-come, first-served basis in our covered parking deck. Parking decals are required and require a one-time fee of $50. Reserved covered spaces are available in the parking deck for $50 per month.